If you’ve kept up with the recent affairs of United Airlines or seen the current closings of Kmart, you know that being a popular brand doesn’t mean much when it comes to quality. The same goes for credit card processing companies. Our merchant service provider comparison will show you how big names don’t necessarily mean big savings good customer service. We’ll be comparing the features and pricing structures of PayPal, Stripe, and Square and ourselves, hopefully giving you a good idea of which company will work best for you! The fees per payment for PayPal are as high as 3.5% of the transaction, and as low as 2.7%. That may not sound like much, but if you average 465 transactions a month at $50 a transaction, you’re paying PayPal $815 a month! PayPal is useful for new online businesses because it has an auto-approval process that skips manual underwriting, but that can also backfire later because if Paypal suspects something suspicious on your account, they will freeze it and hold all your funds. It doesn’t offer a variety of useful features for merchants, and if you call Paypal support you’ll usually be transferred to India. Unless you have an ebay business, PayPal isn’t your best bet. When it comes to merchant service provider comparison, Square dominates the small volume mobile market. It’s main focus is mobile credit card processing. Square’s main benefit is that they have no monthly fee, so it makes it attractive for businesses processing only a few thousand dollars per month in sales. Despite Square’s size and brand notoriety, the company is still not profitable in the merchant services space. Square has been branching out to add other services such as cash advances and payroll to help subsidize their losses. While solo-preneurs working out of their home garage praise Square’s affordable pricing when they run one sale every other month, most businesses with office space and staff won’t consider Square because their “one size fits all” pricing package hurts businesses as they grow. Usually once businesses hit $5,000 per month or more in sales, they move to a true merchant account provider to escape Square’s high rates. Square’s credit card processing rates are 2.75% per swipe or 3.5% for manually entered cards. Also, setting up an account with Square is pretty fast, but it can get shut down just as quick. Being a third-party payment aggregator means their stringent risk department could put a hold on your account easily if you run any transactions that are too large. A great range of eCommerce features is Stripe’s best quality. Developer support for digital goods are clean coding are also a benefit. Stripe also has a reporting tool that allows you to create your own SQL queries to do so. The downsides of Stripe include its 7-day batch deposit time and spotty customer service. Combine the two and you’ve got a full Stripe voicemail box filled with complaints about not getting your money soon enough. Businesses would suffer greatly from this delayed funding and lack of support. 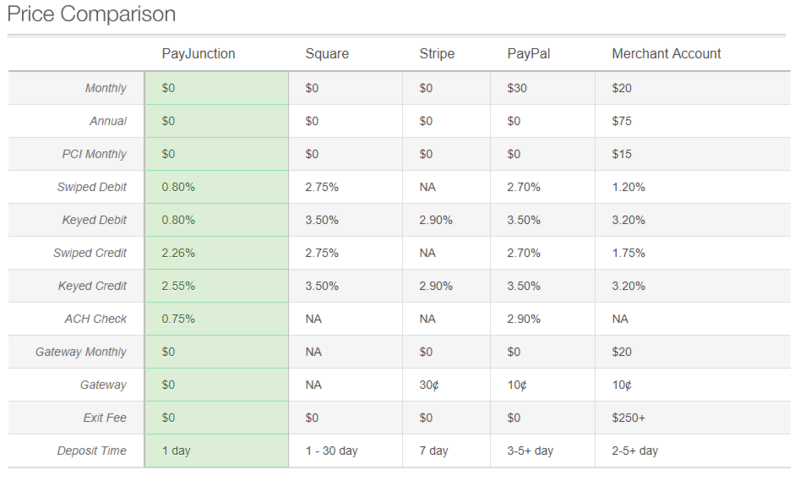 Stripe, just like Paypal and Square, also offer flat rate pricing at 2.9%. So any eCommerce business that grows beyond a few sales per month will want to move to a different provider for lower rates on higher volume processing. 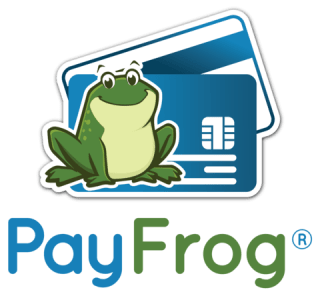 PayFrog is a certified reseller of PayJunction. That means we act as your personal representative and teacher of the payment processing business. Our chat feature and customer service ensures you’re always attended to. The price-match tool we offer ensures the best price out there. We perform full underwriting up front so that way we never have to hold your funds. You’re a real business; you deserve a real merchant account. In fact, you’ll get your sales deposited in 1 business day. We’re A+ rated with the BBB, and we have U.S. phone support with friendly, knowledgeable support representatives. 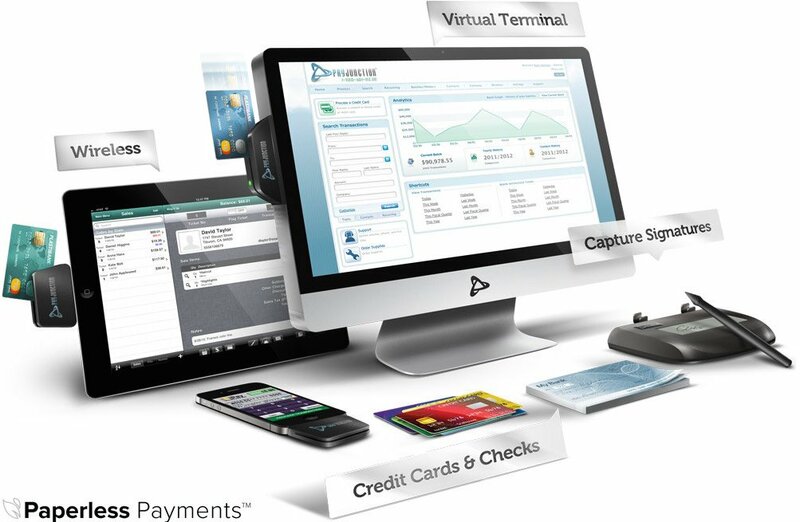 Additionally, our reliable hardware ensures you’ll never miss out on a transaction. The best critic of us, however, is you! How do you feel about our merchant service provider comparison? Let us know in the comments section below! Please get to know us by checking out our PRICING or examine our unparalleled FEATURES that will help grow your business.